The Daddi Long Legs anti-bird device is a unique and versatile anti-perching device that will protect virtually any surface but is specifically designed to protect surfaces that require regular maintenance. The Daddi Long Legs anti-bird device is a spider-shaped deterrent with a rotating head from which fine stainless steel wire ‘arms’ protrude. This product is manufactured and distributed by a company in the United States called Bird-B-Gone. The unit is mounted on a UV protected polycarbonate base and comes in three sizes; 1.25 metre diameter, 1.8 metre diameter and 2.5 metre diameter. Each model will protect a circular area equivalent to the spread of its ‘arms’. The stainless steel ‘arms’ are constructed from extremely thin wire and as a result move and wave freely in the wind. When a bird attempts to land on the surface protected by the device, its feet will touch the ‘arms’ resulting in the bird feeling unsafe and aborting its landing. The ‘arms’ should extend slightly over the area to be protected (2" is recommended by one supplier) to ensure that birds cannot perch on the edge of the surface. If more than one unit is installed the ‘arms’ of each unit should just touch each other. The Daddi Long Legs anti-bird device can be used to protect a wide variety of surfaces including street lights, air conditioning units, grain silos, flat roofs, boats and virtually any other surface. 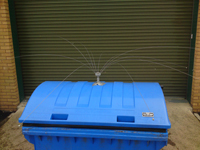 Although the product is relatively expensive compared to industry standard products such as the anti-roosting spike, its main application is intended to be hard to protect areas such as a domed street light housing or the roof of grain silo where conventional products may be less effective. As the Daddi Long Legs anti-bird device requires no maintenance and is simple and quick to install the product will have particular appeal to those wishing to undertake a DIY installation. The product would also be ideal for mounting in areas where access is difficult or expensive. The Daddi Long Legs anti-bird device is virtually invisible when viewed from a distance mainly due to the extremely thin stainless steel ‘arms’ and the white plastic base and head. When mounted against the skyline the unit is almost impossible to see. The plastic base and head are made from a material called delrin, a frictionless material that allows the base and head to rotate freely. The only disadvantage of delrin is that the material is resistant to glue so an acrylic mounting plate is supplied with each Daddi Long Legs so that it can be screwed to the base of the unit. The acrylic plate is then adhered to the surface to be protected with a strong adhesive. Alternatively the base of the hub can be screwed directly to the surface to be protected with stainless steel screws. In areas where high maintenance regimes are necessary or where constant human access is required, the Daddi Long Legs anti-bird device is ideal due to the fact that the ‘head’ can be de-mounted from the base unit whilst maintenance takes place. Once maintenance is completed the head is simply re-attached to the base unit. The only other ‘reversible’ product on the market is the anti-roosting spike which can also be removed and replaced with ease when access is required. The Daddi Long Legs anti-bird device is highly recommended for specialist installations such as pleasure craft in marinas where problems with gulls and pigeons are common and where conventional products are often inappropriate. Several ingenious adaptors are available to fix Daddi Long Legs to commonly-used perching places on boats. A railing mount is available to attach the unit to safety railings around the boat with a quick-release screw so that the unit can be de-mounted quickly and easily. A ‘boat mount’ is also available that allows the unit to be attached to almost any area of a boat with bungee cords or rope – examples of where the adaptor might be used to great effect is on a coiled sail or horizontal mast. Finally, for all areas where the ‘boat mount’ and the railing clamp cannot be used, a ‘sandbag base’ is available. The sandbag base is simply a weighted bag of sand to which the unit can be easily attached. Another example of where the Daddi Long Legs anti-bird device can be used to protect an area often used by birds but difficult to protect is a flat roof. The roofs of single storey extensions are commonly used by garden birds and pigeons as a vantage point to exploit food provided on bird tables. Flat roofs are also used extensively by seagulls for the purpose of nesting. Most roofs, particularly felt roofs, are difficult to access and damage can be caused by constant human access to clean-up bird excrement. Daddi Long Legs can be adapted for installation on flat roofs and once installed, requires no maintenance. Daddi Long Legs can be installed on a flat roof by placing paving slabs on the roof at required intervals and then attaching the unit to the slab. The unit can be attached to the slab by drilling 3 holes into the slab, inserting a raw plug into each hole and then fixing with the stainless steel screws supplied. The base unit is ready drilled with three holes for the purpose. The units can then be moved as required, whilst still attached to the slabs, to ensure that the required protection and coverage is achieved. Alternatively the head can be detached from the base unit and then re-installed. The Daddi Long Legs anti-bird device is not discussed on the DEFRA website. To date we have been unable to find any user reviews for Daddi Long Legs but we will update this section as and when user reviews are made available to us. If you are able to provide a user review for Daddi Long Legs please contact the Pigeon Control Resource Centre. Daddi Long Legs is a unique and versatile anti-roosting product that has its main application in difficult to protect and difficult to access areas. Its main advantage is that it is simple and easy to install and most installations can be undertaken without the need to instruct a specialist contractor. The product is as appropriate for residential and ‘home’ installations as it is for large-scale commercial applications, although the cost of the unit is always going to be an issue where the protection of large areas is concerned. Daddi Long Legs is also ideal for specialist applications such as boats or ships and can be fitted to virtually any surface. Daddi Long Legs is a low visibility product and therefore has considerable appeal for those needing to protect an area where aesthetics are an issue. Any bird deterrent or anti-perching device that blends in with the architecture of the building or site concerned is highly sought after but many of the products that fall into this category, such as nylon bird netting, are often prohibitively expensive and can degrade very rapidly. The Daddi Long Legs anti-bird device is ideal for installations against the skyline, such as the roof of a grain silo, where the product is virtually invisible from the ground. The product is also ideal for difficult to protect architectural features due to its low visibility and versatility where installation is concerned. The optional installation products such as the sandbag, railing clamp and boat clamp will allow the product to be installed on to most surfaces with relative ease. Ease of installation also means that the product can be removed quickly and easily should access to the area or surface be required. The only other anti-perching product on the market that offers this degree of versatility is the anti-roosting spike. Daddi Long Legs is ideal for specialist applications such as the protection of boats in marinas or boatyards. Historically gulls and pigeons have been a constant nuisance for boat owners and those managing marinas and boatyards with the only control options being the use of sonic or noise-related devices. These devices may, in part, be effective against gulls outside the breeding season (distress call-related devices are ineffective during the breeding season) but are completely ineffective against pigeons. Daddi Long Legs, however, is an excellent choice for the protection virtually any area of a boat with the added benefit that the product can be quickly and easily removed when not required and then reinstalled when the boat returns to the marina. The fact that the product is white (as are most boats) and is more or less invisible against the skyline further lends itself to this application. One of the most difficult areas of any building to protect is a flat roof. Nylon netting is commonly recommended and used for this application by contractors. Nylon netting is expensive, invasive to install, has the potential to trap birds and often degrades quickly requiring regular maintenance. The Daddi Long Legs anti-bird device is quick and easy to install on flat roofs and has the added advantage that once installed the product requires no maintenance. Should access to the roof be required for any reason the ‘head’ can be removed and replaced easily as can the whole unit if necessary, assuming that it has been attached to a paving slab as is recommended for this application. Daddi Long Legs may be expensive relative to low visibility anti-perching products that achieve the same goal, but the product certainly has validity as a stand-alone device for use in hard to protect areas. If Daddi Long Legs is compared directly with a product such as nylon netting, however, there is no doubt that once installation and maintenance cost associated with the installation of netting are taken into consideration, Daddi Long Legs would be the more cost effective option. If used in conjunction with anti-roosting spikes the combination of the two products will often be all that is required to comprehensively proof a building, particularly where aesthetics are an issue or where invasive bird exclusion products are forbidden, such as on many grade listed buildings. The benefits and flexibility of the Daddi Long Legs anti-bird device appear to outweigh any disadvantages associated with the initial cost of purchasing the unit.